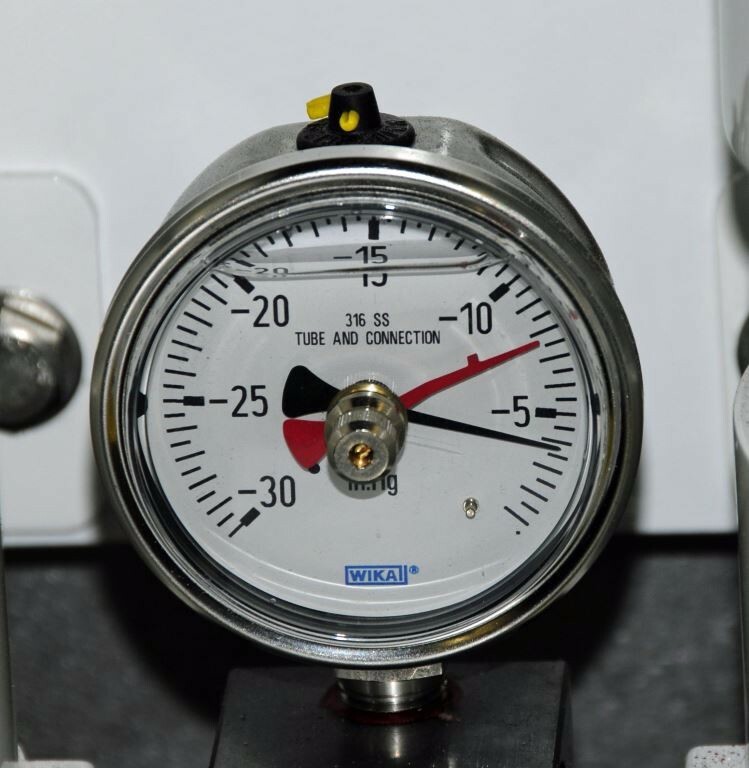 In order to effectively utilize a vacuum gauge for fuel system analysis or troubleshooting it must, A – be properly installed, B – the user must understand how it works and how to read it, and C – it must be monitored. Typically, vacuum gauges are installed at or near the primary fuel filter. All Racor tandem series filter assemblies include a compound pressure/vacuum gauge. The gauge shown in the accompanying image is installed in such a tandem filter's manifold. The pressure portion of the gauge is typically not relevant, unless the filter is installed well below tall fuel tanks that feed from the bottom, in which case it's possible that the fuel supplying the filters will be under pressure and the gauge may indicate this. While this is not harmful in and of itself and while Racor turbine series filters are capable of working under as much as 15 psi pressure, vacuum or suction applications are recommended by the manufacturer. Gauges that are equipped with drag or recording needles or re-settable pointers are especially useful in that they record the highest vacuum experienced by the system for later viewing. It's important to remember, the fuel system vacuum is typically greatest when the engine is operating at cruising or full rpm, checking the vacuum while the engine is idling, or off, will often reveal little if anything about the condition of the filter element. With a drag needle, the operator no longer needs to crawl into the engine room while the vessel is at cruising speed in order to ascertain fuel vacuum readings. In my opinion, installation of a recording vacuum gauge is one of the most valuable, cost effective and inexpensive upgrades one can make to a fuel system. Using the vacuum gauge for fuel system analysis and troubleshooting may seem intuitive and for the most part it is. If the vacuum increases, the filter needs to be changed. A base line must be established with clean filter elements, however, in order for the vacuum gauge's readings to be meaningful. If, with clean elements the vacuum is one or two inches of mercury, this essentially becomes your “zero set point” and it should be recorded on a tag or label adjacent to the gauge. Meaning, obviously, anything over this is a result of clogging or a fault. If the zero set point is high, say above 4 inches of mercury (most vacuum gauges are calibrated in inches of mercury, anything over about 7 is considered high, although virtually every engine manufacturer sets their own limits) the system has other resistance to flow problems that should be addressed. If no notation was made of the vacuum with clean elements, with the engine under heavy load, then calling on the vacuum gauge to assist in troubleshooting an operating problem later will be more problematic. If the system always ran at 7 inches of mercury (not good) then this reading may lead to chasing faults that don't exist or they may exist elsewhere in the system. High vacuum, by the way, can lead to reduced fuel lift pump life as well as (very expensive to repair) cavitation erosion within the injection pump.